If you are looking for a Malaysia craft centre facilities where you would like to see and experience for yourself how the crafts of Malaysia are made, head to the Kuala Lumpur Craft Complex located at Jalan Conlay, near KL "Golden Triangle"shopping area. The complex was built with the purpose of educating, marketing and promoting of the various crafts of Malaysia. You will have a unique experience in handling the drawing of pattern to the batiks or the ceramic items at the workshop. 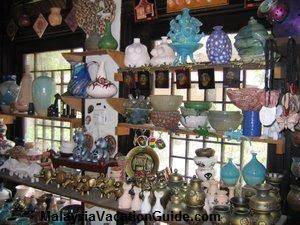 Learn the history and craft heritage of Malaysia from the displays and write up on the museum located in this complex. The tools and the process used to make the crafts such as "songket" are shown here. The items on display at the entrance of Kuala Lumpur Craft Complex. The artists colony is a traditional village based crafts work where artists from different field of expertise do their work in the open for you to see. Each is located at the WAKAF, an open air wooden shelters at the compound of the complex.Walk though these "small shops" and see for yourself how potteries, key chains, batik, kain songket or jars are made. The craft village showcase the art of local crafts through demonstration and interactive activities. Discover your hidden talent in making batik or ceramics. Who knows, you may have the hidden talent of a craftsman. Other facilities provided here are the recreational garden for you and family to relax and sit down for a moment before continuing your journey, the children's playground, cafeteria money changers, telephones, shuttle service and the automated teller machine. 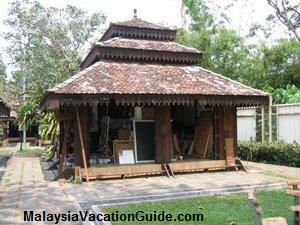 One of the many open air wooden shelters called WAKAF at the compound of the Malaysia craft building. 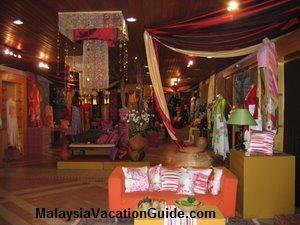 There is a gallery of batik and kain songket for you to look and see. Various textiles and fabrics are displayed and they can be purchased here if you want to buy something of Malaysia as a momento or for friends. 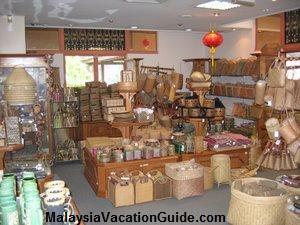 The small baskets, some made from rattan are good items which can be given to friends as souvenir from Malaysia craft centre. Some of the ceramic items and silverwares on display at the centre. The best way to get here is by taking a taxi. If you prefer to walk, take a bus and stop at Starhill bus stop. It will take you approximately 25 minutes to reach here. As the weather can be hot, remember to take a cap. A one way shuttle service can be provided on request from the Craft Complex to the major hotels in the "Golden Triangle" area. Further information can be obtained by calling +6 03 2162 7533. Address: Kuala Lumpur Craft Complex, Section 63, Jalan Conlay, 50450 Kuala Lumpur.